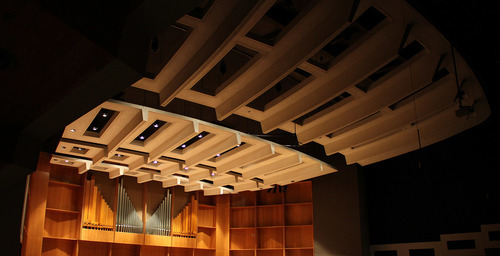 The Davis Concert Hall houses a pipe organ built for the University of Alaska Fairbanks by the Gress-Miles Organ Company of Princeton, New Jersey. Installed between June 1982 and June 1983, the organ was designed by G. Edgar Gress, Vice President and Tonal Director of the Gress-Miles Company, in consultation with Dr. David Stech of the UAF Music Department. The organ is controlled from a three-manual draw-knob type console constructed of American Walnut with Brazilian Mahogany surrounding the keyboard and stop jamb area. The console controls the valve mechanisms by use of electro-mechanical action with solid state switching. Low wind pressure and classic voicing is used throughout, with a few ranks designed in nineteenth century style. The instrument consists of forty-four ranks (rows of pipes), sixty-six stops and 2471 pipes. The inaugural performance with orchestra occurred on October 23, 1983. The featured work was the Saint-Saens Symphony No.3 in C Minor with the Fairbanks Symphony Orchestra conducted by Gordon Wright and Dave Stech at the console.